Archeologists have found a room and aisle which were thought to be dating back to the Early Bronze Age. A first-degree archaeological site in Turkey's Bayburt province, as part of a rescue excavation, made the discovery of a room and aisle that are thought to date back to the Early Bronze Age. A rescue excavation was initiated in Çiğdemtepe Village, which is 14 kilometers away from Bayburt city center. Called "Hakimtepe" by local people, the mound on which the excavation is conducted is accepted as a first-degree archaeological site. Initiated with the cooperation of Bayburt Provincial Directorate of Culture and Tourism and Erzurum Regional Directorate of Cultural Heritage and conducted by the archaeologists of Bayburt Museum Directorate, the excavation paved the way for the revelation of a room and aisle carved in rock. Bayburt Governor Ali Hamza Pehlivan spoke to Anadolu Agency (AA) and stated that throughout its some 5,000 year-old history Bayburt became home to so many civilizations, traces of which were unveiled one by one during excavations. 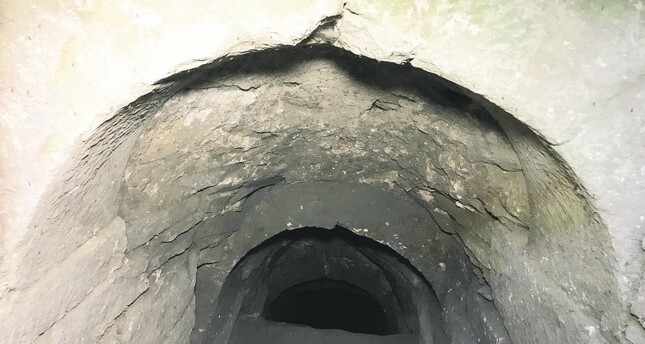 "At the mentioned mound in Çiğdemtepe Village, a study was initiated under the control of Erzurum Regional Directorate of Cultural Heritage in 2018. This study was conducted under the title of 'rescue excavation' within the body of Bayburt Provincial Directorate of Culture and Tourism," said Pehlivan. mations, you go on a journey so-to-speak into the previous civilizations. Experts predict that this mound probably dates back to the Early Bronze Age. Another prediction says that a pendentive formation carved on a rock mass was detected toward the bottom of the mound which was probably built during the Roman period. By carving the rock mass by 30-40 meters, rooms were built in the mentioned formation." Pehlivan noted that during the rescue excavations they covered some 40 meters on the main rock mass carved by previous civilizations and added, "For now, we came up to a room located on the left side of the entrance. This is the current situation of the work. Needless to say the excavation will inspire some scientific articles as time passes by with some progress on the work. No matter what, predictions say that the room dates back to the Early Bronze Age, future findings will offer the precise time period. Hence, the study will show how long ago Bayburt's history dates back and will shed light on the history of Anatolia." Pehlivan stated that the rescue excavation conducted in Bayburt will add a new dimension to many other excavations conducted on various sites in Anatolia and it will continue on in the following year. "We will come across interesting findings as the excavation goes on. Mound excavations always offer a set of new findings both on the geography where it was conducted and on world history. Everyone everywhere will make use of this study. A new record will be registered on Bayburt's list of cultural and historical values. I think that this excavation will also give way to an underground city open to visitors, like the one in Aydıntepe district. The course of the excavation will reveal future prospects."